"This is a tradition at Easter in our family! 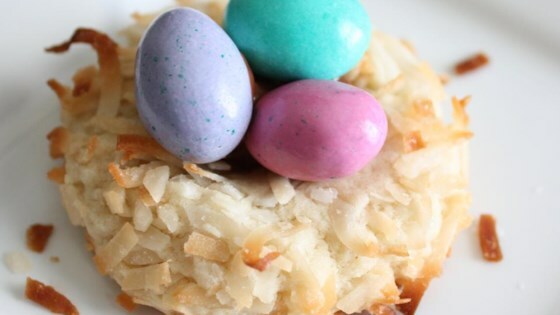 A delicate butter cookie, decorated with colored coconut to look like a little nest and filled with chocolate covered almonds or peanuts." Sift together the flour, baking powder and salt; set aside. In a medium bowl, cream together the butter, cream cheese, and sugar until smooth. Stir in the vanilla, then gradually beat in the dry ingredients. Divide the coconut into three separate containers (see Cook's Note). Color one portion red, one yellow, and leave one plain. Toss the colored coconut together with the plain. Roll cookie dough into walnut-sized balls, then roll the balls in the coconut mixture. Place them 2 inches apart onto the prepared cookie sheet. Press 1 candy into the center of each cookie. Bake for 12 minutes in the preheated oven, then remove from the oven and press 2 more candies into the center of each cookie. Return to the oven to continue baking for another 4 to 5 minutes, until golden brown. Cool cookies on the baking sheet for a few minutes before removing to a wire rack to cool completely. I like to color the coconut by placing it into a jar with the food coloring. Just close the lid and shake until colored. No messy hands! These cookies were a hit with my family. They liked my use of mini jelly beans in place of the chocolate nut, too. There isn't any Almonds in the recipe!!! So clever! They taste great! I used M&Ms chocolate covered peanuts, and they work marvelously, without falling out of the nests. Great recipe but these are not Almond macaroons - they are coconut butter cookies. So delicious, will definitely make again.